Lexus CT200h announced | What Car? Lexus will call its new premium small car the CT200h. The concept version of the car was revealed last year at the Frankfurt motor show, where it was called the LF-Ch. The production version will be unveiled at the Geneva motor show next month. 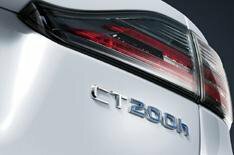 A rival to the likes of the Audi A3 and BMW 1 Series, the CT200h will be powered by a petrol-electric hybrid set-up making it the first hybrid in its class. The LF-Ch concept car is a full hybrid, capable of running for short distances on electric power only, so it's likely that the production version have the same system. Expect the hybrid system in the CT 200h to deliver similar power to the 2.0-litre petrol engines in rivals. Lexus says the CT200h will 'offer new levels of refinement, sophistication and attention to detail, without compromising style or driving pleasure'. Further details will be announced at the Geneva motor show on March 3. The car is due to go on sale in the UK next year.